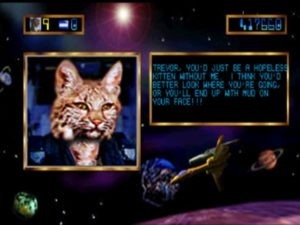 The story goes that Trevor McFur was a project for Atari’s aborted “Panther” console, that became a simple tech demo for the Jaguar hardware, that was then rushed into production when Atari realized their shelves would be coming up embarrassingly short for the holiday season. Despite all the horror stories of Atari under Tramiel management, this seems just a little too panicked and unprepared to believe. But after slogging through the game myself, it actually seems like a very likely possibility. 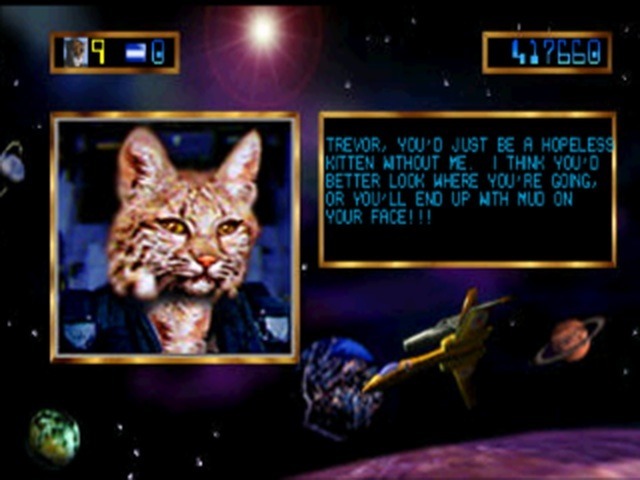 The game has you playing as Trevor McFur; gallant, hotshot fighter pilot for the “Circle Reserves.” Trevor happens to be a jaguar, for no particular reason I can think of [rolls eyes]. In fact, all the characters are different breeds of large cats with human bodies. I assume this is to make the game more kid-friendly, or because a similar game did it, or it could be a little attempt at some humor by tying into Atari’s cat-themed projects. Remember, this is the game that’s supposed to have been a tech demo. As McFur, you travel through five scrolling-shooter planets in a bid to free the Crescent Galaxy from the vile claws of the Odd-It. Each planet has a space level followed by the planet you’ve elected to liberate, with changing backgrounds and bosses between. You can pick any of the four planets or moons to attack in any order, and freeing all four opens up the fifth and final showdown. 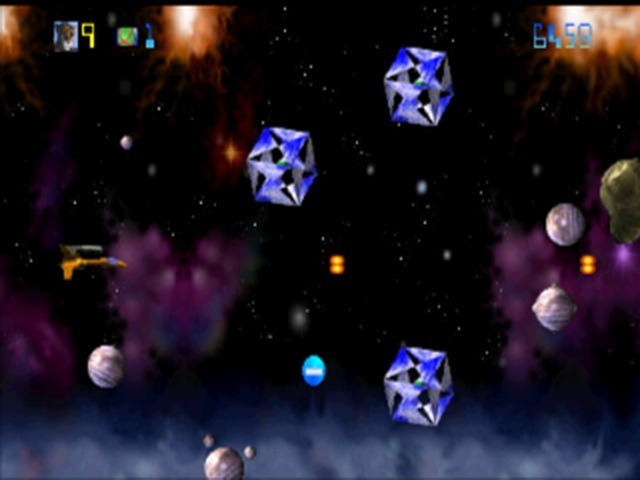 The game itself never changes; endlessly consisting of scrolling left to right and maneuvering your ship up and down to dodge or shoot approaching hazards. 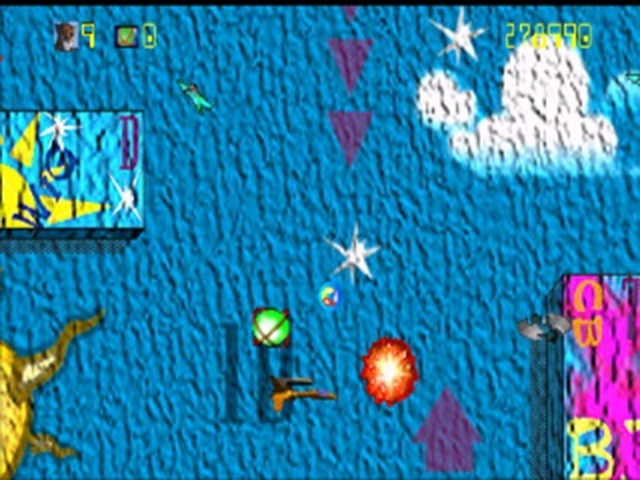 The unique additions to the formula are a variety of creative special weapons and the look of the graphics. Detailed, hand-drawn artwork makes up the backdrops, while computer-generated images provide the frames for some enemies and most bosses. I’m getting quite tired of describing all Jaguar graphics with the following quote, but here we go again… this is a look that could not have been pulled off on competing hardware of the time. The bitmaps alone lend the game a sharp look that couldn’t be matched for a few years to come, and you can see crags and ridges in passing rocks, or blinking stars inside colorful nebulae. Trouble is, the art direction didn’t keep up with the technical possibilities. I can’t settle on describing Trevor’s style. I can’t figure out if this is because the game has too many competing styles, or if it really has no style at all. For example, the jungle level has a background comparable to a concept art painting, and looks visually rich. It shares the screen with a hodgepodge of unrelated, NES-style enemies like pterodactyls, ghostly lion heads, and giant glowing insects. 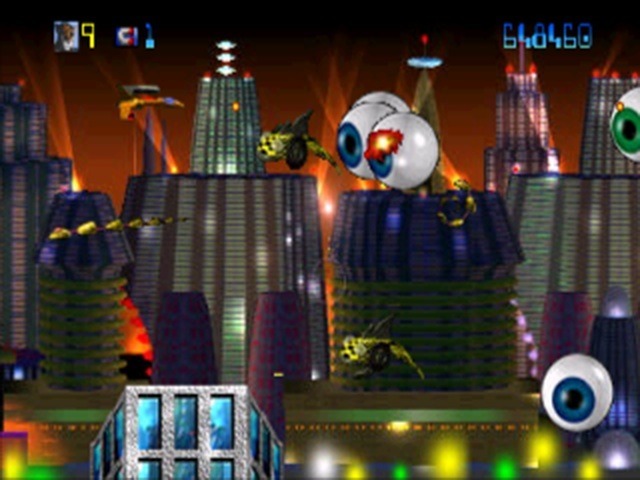 Later levels introduce metallic cherubs with sunglasses, rotating, shiny crystals, some kind of cross between a flamingo and a flying duck, and stranger blobs of bad guys. One planet has you flying over what appears to be a map – no, seriously, a kindergarten paper map floating in space. 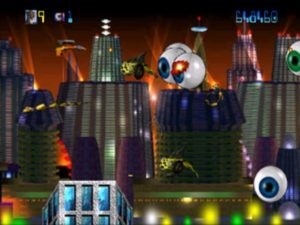 The whole design is so schizophrenic that I can’t definitively call it a futuristic shooter, a kid’s game, or a parody. It truly seems like the director just told the artists to “go nuts” and anything they drew made it in. Or at best, that many enemies were created solely to show off a particular effect – the sparkle of the crystals, the metallic sheen look, the CG rotating of one of the boss ships, etc. Again, given that this is supposed to be rushed, and a tech demo, it’s plausible. There’s very little to set Trevor apart from similar games in the genre. Powerups are the most creative contribution here. You can call in a female wingman/woman/cat to assist you, though her AI is limited to shooting a steady, slow stream of bullets and barely moving. You have a powerful laser effective in cutting through bosses. You have a giant horseshoe magnet that pulls enemies toward it and destroys them. You have a energy screen that expands out in front of you and sweeps up baddies. There is certainly plenty to shoot. The list continues to about nine in all, and all are fairly distinct and effective in their own ways. You can cycle through the specials using the option key, or try to select a particular one using the controller’s keypad. The ability to do so is appreciated, but it requires waiting for a break in the action and shifting your hand briefly to the pad. Also, good luck trying to remember what’s what without the overlay. Overall, trying to fly and select specials at the same time ended up being more dangerous than it was worth, so ended up just shooting off whatever special was loaded, followed by the next in line. At least the option to select them individually is there, should you happen to grow a third hand. While the artwork is detailed, many of the backgrounds look flat. Trevor’s ship is hard to follow against many of the backgrounds, and it’s very easy to lose an enemy creeping up on you from the screen edges. There’s also no memorable effects or sequences in these levels, they just passively scroll by. You’ll always have something flying at you, and a number of enemies are shiny and sharp, but truly there’s nothing about Trevor that makes it absolutely worth seeing or playing. There’s a total lack of background music as well. Even if you don’t place much emphasis on in-game music, or immediately turn it off if presented the option, its absence only serves to highlight how weak the rest of the sound is. Gunfire effects on both sides of the conflict are way overused, while explosions are weak and tinny. Whether the audio was rushed or left out really isn’t our concern, but the results of the choice don’t go unnoticed. Really, that’s a nice way to sum up the entire game. Whether it was rushed, only meant to be a tech demo, or produced on a shoestring budget really isn’t our concern. It’s a professionally released title, shipped to stores in a box which you pay money for, and it comes off looking and playing like a homebrew title. The high-resolution backgrounds can’t help the game make up for being one of the most boring and unfocused shooters I’ve ever played. This is was certainly not the kind of game the Jaguar needed to justify its price tag. Detailed background art, high-resolution compared to other consoles. Everything else. Weak sound, unsatisfying and uninspired shooting, mercifully short but still a rip-off.